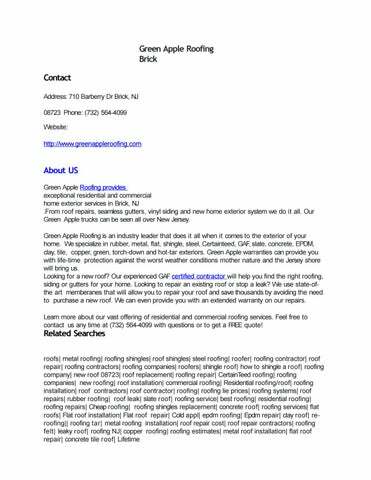 About US Green Apple Roofing provides exceptional residential and commercial home exterior services in Brick, NJ .From roof repairs, seamless gutters, vinyl siding and new home exterior system we do it all. Our Green Apple trucks can be seen all over New Jersey. Green Apple Roofing is an industry leader that does it all when it comes to the exterior of your home. 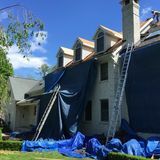 We specialize in rubber, metal, flat, shingle, steel, Certainteed, GAF, slate, concrete, EPDM, clay, tile, copper, green, torch-down and hot-tar exteriors. Green Apple warranties can provide you with life-time protection against the worst weather conditions mother nature and the Jersey shore will bring us. Looking for a new roof? Our experienced GAF certified contractor will help you find the right roofing, siding or gutters for your home. Looking to repair an existing roof or stop a leak? We use state-ofthe art memberanes that will allow you to repair your roof and save thousands by avoiding the need to purchase a new roof. We can even provide you with an extended warranty on our repairs. Learn more about our vast offering of residential and commercial roofing services. Feel free to contact us any time at (732) 564-4099 with questions or to get a FREE quote!